Skeleton in the Closet is ready to show in your gallery, museum, or university. From the full set of images, an appropriate number of images may be selected to fit your space. Framed pieces are 16×20; the 5×7 text placard is hung next to the framed print. For galleries wired for sound, the show also includes an audio component, in which the stories are whispered at low volume, heightening the viewer’s sense of secrecy and constant internal dialogue experienced by the subjects in the series. Please contact us for more information, or to schedule your show. For universities, this body of work also lends itself well to cross-promotion and education. 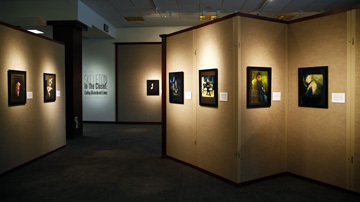 The series is appropriate for fine arts galleries, but also pertains to health, medical, psychology, women’s studies, and counseling departments, as well as the student life department. 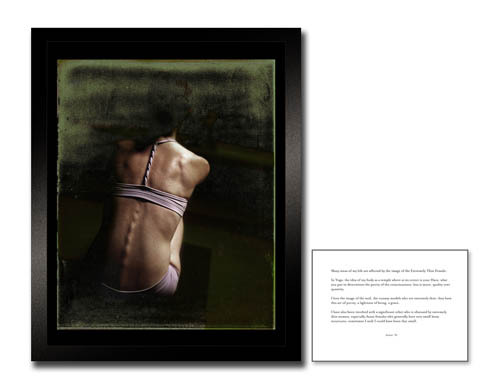 The exhibit gives universities a locus for arts and eating disorder awareness events, outreach, and education. Consider a collaboration that might include lectures, forums, and publications related to eating disorders. It also makes for an excellent opportunity for community outreach, and great PR. The artist is also available for lectures. Please inquire with your proposals.